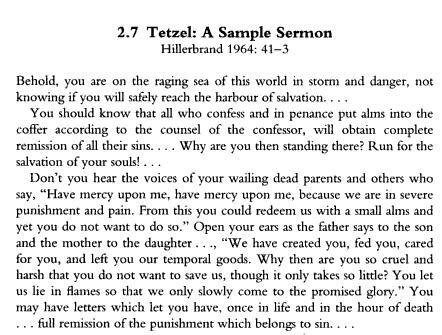 Beggars All: Reformation And Apologetics: Did Tetzel Really Say "As soon as the coin in the coffer rings, the soul from purgatory springs"? Did Tetzel Really Say "As soon as the coin in the coffer rings, the soul from purgatory springs"? 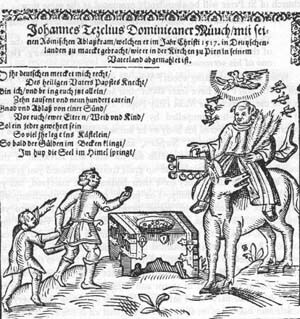 "This reminds me how there is no primary source for Luther's accusation that Johann Tetzel said "As soon as the coin in the coffer rings, the soul from purgatory springs." It is pure hearsay that everyone seems to accept as fact" [source]. It is usually taken at absolute fact that Tetzel often used this jingle while preaching his indulgence sermons. It may be surprising to find out that attributing this exact jingle to Tetzel isn't as easy as one may think. Roman Catholics have a valid gripe if they question if Tetzel was the originator of the jingle "As soon as the coin in the coffer rings, the soul out of purgatory springs" (Sobald der Pfennig im Kasten klingt, die Selle aus dem Fegfeuer springt). Sometimes Protestants think this phrase was unique to Tetzel, sort of like the way the phrase "your best life now" is attached to Joel Osteen. There is no evidence I know of that Tetzel came up with this jingle. 27. They preach only human doctrines who say that as soon as the money clinks into the money chest, the soul flies out of purgatory. 28. It is certain that when money clinks in the money chest, greed and avarice can be increased; but when the church intercedes, the result is in the hands of God alone (LW 31:27). Under your most distinguished name, papal indulgences are offered all across the land for the construction of St. Peter. Now, I do not so much complain about the quacking of the preachers, which I haven’t heard;﻿﻿ but I bewail the gross misunderstanding among the people which comes from these preachers and which they spread everywhere among common men. Evidently the poor souls believe that when they have bought indulgence letters they are then assured of their salvation.﻿﻿ They are likewise convinced that souls escape from purgatory as soon as they have placed a contribution into the chest (LW 48:45, cf. LW 60:172). "Even the much-discussed sentences concerning the automatic effect of the indulgence for the dead- which were later compressed intohe famous rhyme, 'So soon as coin in coffer rings, the soul from purgatory springs'- were not in substance new, but merely an apt practical application of the commonly accepted doctrine, as it had been publically set forth, for example, only a few years before by Luther's fellow-Augustinian, John Jenser of Paltz in his Coelifodina" (Road to Reformation (Philadelphia: Muhlenberg Press, 1946), p. 180). The saying about the money in the coffer cannot, indeed, be traced to Tetzel's own lips, yet in his sermons he advocated a certain opinion held by some Schoolmen (though in no sense a doctrine of the Church), viz. that an indulgence gained for the departed was at once and infallibly applied to this or that soul for whom it was destined. (Luther 1, p. 343). Grisar cites Cardinal Cajetan as a "great theologian" against Tetzel's teaching on this (also claiming Tetzel "was no great theologian"). Grisar though admits "the more highly placed Indulgence Commissaries did not scruple, in their official proclamations, to set forth as certain this doubtful scholastic opinion" (p. 344). Roman Catholic historians defending Tetzel place the blame for Tetzel's doctrinal error on "vague scholastic opinion." this sort of apologetic though downplays the fact that during this time period there was no official doctrine or dogma as to the effect of the indulgence upon those in Purgatory. Mathesius and Johann Hess, two contemporary witnesses, ascribe this sentence (with slight verbal modifications) to Tetzel himself. Luther mentions it in Theses 27 and 28, and in his book Wider Huns Wurst (Erl. ed. XXVL 51). the chest, the souls of the deceased friends forthwith went into Heaven,' was, according to Prierias, actually preached as 'mera et catholica Veritas'" [source]. According to Brecht, Tetzel "was in complete command of the indulgence propaganda, as his preserved indulgence sermons indicate. 'Here is Rome,' he proclaimed very directly, and by no means incorrectly. People should not let the salvation offered by the indulgence escape them. 'Have mercy upon your dead parents.' 'Whoever has an indulgence has salvation; anything else is of no avail.' " (Brecht, pp. 182-183). Addendum 1: The Commission of Indulgences can be found here. From the Latin. Gieseler: Ecclesiastical History, Vol. V., pp. 225-26. You may obtain letters of safe conduct from the vicar of our Lord Jesus Christ, by means of which you are able to liberate your soul from the hands of the enemy, and convey it by means of contrition and confession, safe and secure from all pains of Purgatory, into the happy kingdom. For know, that in these letters are stamped and engraven all the merits of Christ's passion there laid bare. Consider, that for each and every mortal sin it is necessary to undergo seven years of penitence after confession and contrition, either in this life or in Purgatory. Do you not know that when it is necessary for anyone to go to Rome, or undertake any other dangerous journey, he takes his money to a broker and gives a certain per cent—five or six or ten—in order that at Rome or elsewhere he may receive again his funds intact, by means of the letters of this same broker? Are you not willing, then, for the fourth part of a florin, to obtain these letters, by virtue of which you may bring, not your money, but your divine and immortal soul, safe and sound into the land of Paradise? "There is little doubt that Tetzel's preaching was well summed up in the phrase, 'a coin in the box opens heaven to your soul,' and there is no doubt either that the deal between Albrecht and the Curia as well as the lively trade in indulgences would have been condemned as the worst type of simony in the early Church" [Joseph Lortz, The Reformation, a Problem for Today (Maryland: The Newman Press, 1964), p. 79]. "As much cannot be said about his teaching regarding indulgences for the dead. 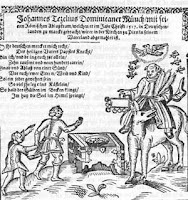 The couplet attributed to him —As soon as the gold in the casket rings The rescued soul to heaven springs, like that attributed to Luther, Who loves not wine and wife and song, Remains a fool his life long; though verbally spurious, can in both instances be in substance unfailingly traced to the writings of their respective authors. By Tetzel they are substantially acknowledged in his Frankfort theses. Here he accepted the mere school opinion of a few obscure writers, which overstepped the contents of papal indulgence Bulls. This opinion found no recognition but actual condemnation at the hands of authoritative writers, and was rejected in explicit terms by Cardinal Cajetan as late as 1517-19. By the teaching he laid himself open to just censure and reproach. To condition a plenary indulgence for the dead on the mere gift of money, without contrition on the part of the giver, was as repugnant to the teaching of the Church, as it violated every principle of elementary justice. "Preachers act in the name of the Church", writes Cardinal Cajetan, "so long as they teach the doctrines of Christ and the Church; but if they teach, guided by their own minds and arbitrariness of will, things of which they are ignorant, they cannot pass as representatives of the Church; it need not be wondered at that they go astray" (Paulus, "Johann Tetzel", 165). It was this deviation from the correct teaching of the Church and the obtrusive and disgraceful injection of the treasury chest, that led to abuses and scandals reprobated by such contemporaries as Cochlæus, Emser, and Duke George (Paulus, op. cit., 117-18). "Grave abuses arose; the attitude of the preachers, the manner of offering and publishing the indulgences aroused many scandals; above all, Tetzel is in no way to be exonerated" (Janssen-Pastor, "Geschichte des deutsch. Volkes", 18th ed., Freiburg, II, 84)." Outstanding! Thanks so much for this! This post has been sitting in draft for a while. I would think, if someone is looking to do a book on a Reformation topic, a new book on Tetzel seems to be a wide open field. The Papal Bull of indulgence gave no sanction whatever to this proposition. It was a vague scholastic opinion, rejected by the Sorbonne in 1482, and again in 1518, and certainly not a doctrine of the Church, which was thus improperly put forward as dogmatic truth. Pastor notes that the leading theologian Cardinal Thomas Cajetan opposed these extravagances. In the blog post above, I link to Pastor's book. I also link to the commission of indulgences that Tetzel had, so you can read an excerpt from it yourself and see that he certainly did teach what the jingle claims, and was instructed to. Even Grisar states "the more highly placed Indulgence Commissaries did not scruple, in their official proclamations, to set forth as certain this doubtful scholastic opinion". In the extant sermons of Tetzel, he does say one who purchases an indulgence must be contrite. Roman Catholic historians (like Pastor) highlight that fact, as if this excuses Tetzel for what he did preach. As I state above,during this time period there was no official doctrine or dogma as to the effect of the indulgence upon those in Purgatory. So, saying "Tetzel overstated Catholic doctrine in regard to indulgences for the dead, but his teaching on indulgences for the living was orthodox" is anachronism. On the bright side, the bit about Cajetan is accurate. Tetzel died in Leipzig in 1519. At the time of his death, Tetzel had fallen into disrepute and was shunned by the public. On his deathbed, Tetzel received a magnanimously penned correspondence from Martin Luther, stating that the child (i.e. the scandal) had a different father. Also, was it true that Tetzel's fund raising was not at all for the reconstruction of St. Peter's Basilica, but towards helping the Archbishop of Mainz, Albert of Brandenburg, pay off his simony loan? Not only the reputation, but also the health of the indulgence-seller, John Tetzel, was broken by the storm started in 1517. When Luther heard that he was mortally ill, he wrote to comfort him, and bade him "not to be troubled, for the matter did not begin on his account, but the child had quite a different father." The letter is lost, but this quotation is preserved in Emser's: Auff des Stieres su Wittenberg wiettende replica. See Brecht's first volume on Luther- Half of the money raised by the sale of indulgences was to go to Rome, the other half went to the Fugger Banking house, which loaned him the money to buy his office. Like with the Mormons (esp. with the Mormons!) i think there is a problem with editors on WP who are defenders of these faiths removing negativity them toward, or liberals against faith. I try to make such more objective in such a case, and so for now that sourced statement corrects the former. It's impossible to check every fact in every source. 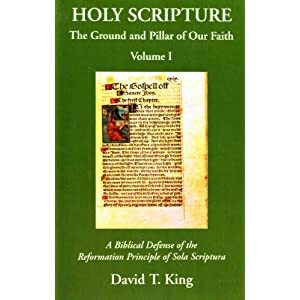 I don't often use Wiki for Reformation research, particularly because I have an extensive library of materials on the Reformation written by qualified scholars. I also think it's humorous a few Wiki pages refer to some of my writings for references. I certainly didn't add those links, nor do I know who did.